In March 2010, a large number of jumpers were transported from their assembly yard in Takoradi, Ghana, to Ghana's first offshore oil field. 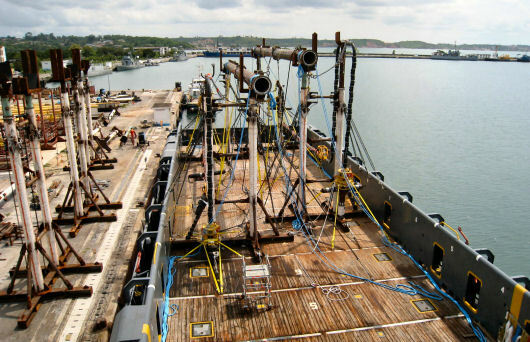 For these transport, large supply vessels were selected and the jumpers were transported with their lifting spreaders elevated on adjustable support stands. These same boats were used to transport a number of underwater skids. Argonautics Marine Engineering, Inc. was hired to go on site and survey the support craddles. The engineering calculations of the stands were reviewed and recommendations were made to improve the proposed lashings. The stability of the loaded supply boats was checked. Provide assistance to another surveyor during the skid loading and seafastening.